MovieMator Free Mac Video Editor is a free but quite professional Mac video editing software, which is carried with 60+ professional-looking filters and transitions. Amazing home movies and vivid photo slideshow will be created in a few minutes with this free video editor for Mac! MovieMator Free Mac Video Editor not only allows users to do all the basic editing work such as trimming, cropping, splitting, rotating, merging and more, but also provides more advanced editing features like video overlay (PIP), Slow/Fast Motion, etc. 1. Unlimited video tracks and audio tracks help users handle all large projects. 2. 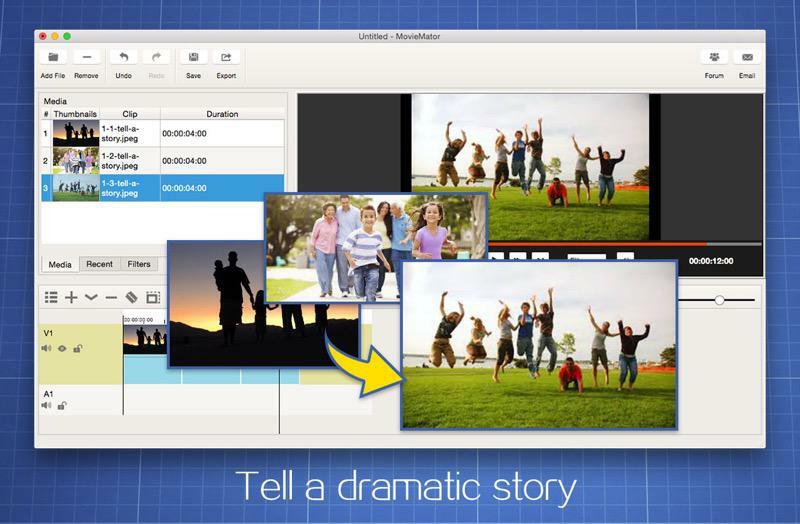 Trim / Merge / Split / Crop / Rotate video/audio/image clips of any format with MovieMator Free Mac Video Editor. 3. The interface of MovieMator Free Mac video editor is extremly intuitive and all features are clear at a glance. 4. This video editor for Mac fully supports all media formats and can incredibly fast export HD videos in 200+ media formats like MP4, AVI, MPEG, WMV, MKV, MPG, RMVB, M4V, 3GP, FLV, TS, M4V, VOB, F4V, MP3, WAV, MKA, OGG, FLAC, AAC, JPG, PNG, TIF, BMP, SVG and more for playback on all devices. 5. Create Fast/Slow-motion video by adjusting the playing speed as you like with this video editing software for Mac. 6. MovieMator Free Mac Video Editor allows you to set fade in/out time for videos and audios with freedom. 7. Make your work personalized with PIP and other Hollywood-level effects. 8. Easy-to-use cut, copy, and paste operations in this free video editor Mac. 9. Hide, mute, and lock video track and audio track with one-click. 10. Arrange and Trim all elements on the timeline by dragging and dropping. 11. Real-time preview feature ensures what you see is what you get. 12. Customize output parameters like resolution, frame rate, aspect ratio and etc. 13. Auto save the project for direct editing next time when the window is closed unexpectedly. 2017-01-06 1.4.7 Fixed some critical bugs.